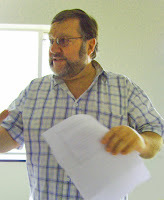 The year 2010 will be the "Year of Family Fun" for the West Gauteng Branch of the GSSA, Dennis Pretorius declared at the branch's latest meeting on 20 February. Dennis spoke about the branch entering its tenth year of existence. The branch was formed on 10 February 2001. He is one of three founding members still involved in the branch's activities. The other two are Barbara Bouwer and Margaret Humphries. To have 10 fun meetings this year. Members are to help by making suggestions for fun meetings. To donate 10 books that you don’t need any longer or to lend books to our library. To print the research the members have done on their families and to add this to the library. The research should be printed from the genealogical program being used. Lucas Rinken, Richard Ford and Dennis Pretorious will guide/assist members. Increase our membership by 10 members. Publish a gallery/ photo collection of our branch’s members, both past and present. A photo and short biography of each member is needed. This will then be bound in book form. To collect all the minutes of meetings held since the branch was founded. This should be bound in book form. The same is to be done with the newsletters written in the last nine years. To share your knowledge with 10 members this year. We were encouraged not to be shy about asking for help, neither should we hesitate to help others. Teatime is a good time to share knowledge. Transcribing and making records available for others. We could be assisting by doing 10 hours of work per month (or 20 minutes per day). This would mean typing in data from forms/copies. Various members assisted with the Braamfontein Cemetery recording project, which was very successful. The 1984 voters roll is an enormous project. Help is needed to capture the surnames of married women. He urged members to never stop enjoying their genealogical research. Not even for 10 minutes! Involve your families as it makes the work more fun and interesting. Each member present was given a form to complete committing themselves to one or more of the projects. Chairman Lucas Rinken concluded by supporting Dennis's proposals, urging members to participate in the "Year of Family Fun".